You might not be able to control the weather, but you can control how you view it. Whether you are dealing with rain or shine, your windows keep you safe from the elements. Instead of only providing cover from cold temperatures, rain, sleet and snow, windows can impact your bills as well! 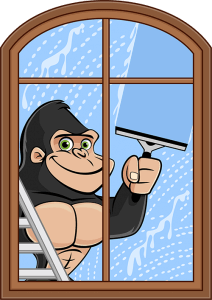 When dirty windows are taking away from your views, call a Gorilla Property Services for your Moose Jaw window cleaning service. When one window around your property isn’t looking its best – none of them are! Each side of your property will have its own unique challenges, but dirt, debris and buildup happen all around. Professional window washing does more than just remove dirt from panes, but it preserves the condition of your glass as a whole. Everyone understands that glass is fragile but some is more delicate than others. Despite being hard to the touch, glass is a porous substance. Leaving dirt, grime or debris sitting against surfaces lets foreign materials seep beneath surfaces. The further these unwanted items go, the higher your chances of damage. When materials are weakened from the inside and out, even the smallest bump can mean a spider crack or a full shatter. Don’t take the chance on broken glass when a Gorilla can keep you going strong! Both exterior and interior window cleaning have their own setbacks. Interior window cleaning is subject to technique while an exterior window is just hard to reach. Professional window cleaning gets a streak free shine at any level. Far from grabbing a roll of paper towels and basic blue cleaner, our technicians clean using a variety of tools. Simply wiping the surface of glass creates a static cling that attracts new dust and dirt. There is just no point in cleaning windows only to have them looking dirty immediately after. When you call a Gorilla for your window washing service, you are getting long-lasting results for every aspect of your fixture. Treating panes is not the be-all, end-all of our services. By inspecting and treating sills, frames and the surrounding areas, our Gorillas extend the lifespan of your windows through routine maintenance. In order to get the best results for our clients, Gorillas put an arsenal of tools to use. After assessing the condition of your home or commercial space, our specialists choose the right tools for the job. When targets are within reach, Gorillas combine an eco-friendly cleaning solution with rubber squeegees. These tools eliminate static while cleaning out every crack, crevice, nook and cranny. In order to reach those higher windows, water-fed poles and a mobile water source are put to work. These simple but specialty tools allow our Gorillas to get their paws on glass up to four storeys. With expert results and customer service within arms reach, there is no reason not to call a Gorilla!